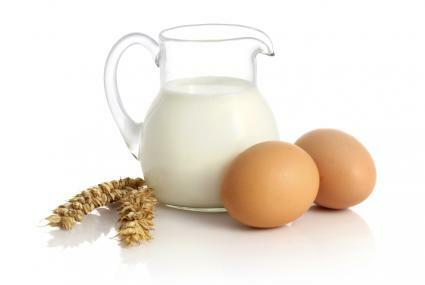 Dairy and eggs provide niacin. Too much of a good thing really can be bad for you. This is the case with niacin, also known as Vitamin B-3, as it is with many vitamins and minerals. While niacin is something that your body needs, taking in too much of it can result in niacin toxicity. Most people have no problem getting more than the recommended daily allowance (RDA) of niacin through their diets and are not likely to need to take supplements. Adults should not exceed 35 milligrams/day of niacin in their diet or through supplements. The only individuals who might need supplements are those who truly have a niacin deficiency, an unusual health condition that you should not assume that you have unless diagnosed by a physician or qualified nutritional expert. While niacin toxicity and deficiencies are rare, they do occur, and it's important to note the symptoms and signs to prevent serious illness. A well-balanced diet of fresh fruits, vegetables, lean meats, and whole grains can often prevent dangerous vitamin imbalances in most healthy adults and provides a much healthier way to get the niacin that you need than supplements. Those with pre-existing conditions like diabetes or liver disease should consult a doctor with regard to the appropriate RDAs, as these conditions can be particularly affected by niacin.